Red and I love Thai food. We can eat it every day, just like pizza and we will never get sick of it. Seriously. Red even loves the spice and heat in Thai dishes more than I do, believe it or not. For the longest time, we each were spoiled to have lived in areas where great authentic Thai restaurants are just around the corner. When we moved to our town where we live now, we don’t have access to a Thai restaurant anymore (booo!!). There was one that closed shortly after we moved here; and that was basically the end of it. I have so many recipes tagged in my Steamy Kitchen Cookbook and this was one of them. The promise of having a delicious Thai meal at home with ingredients that I can easily get was so tempting. 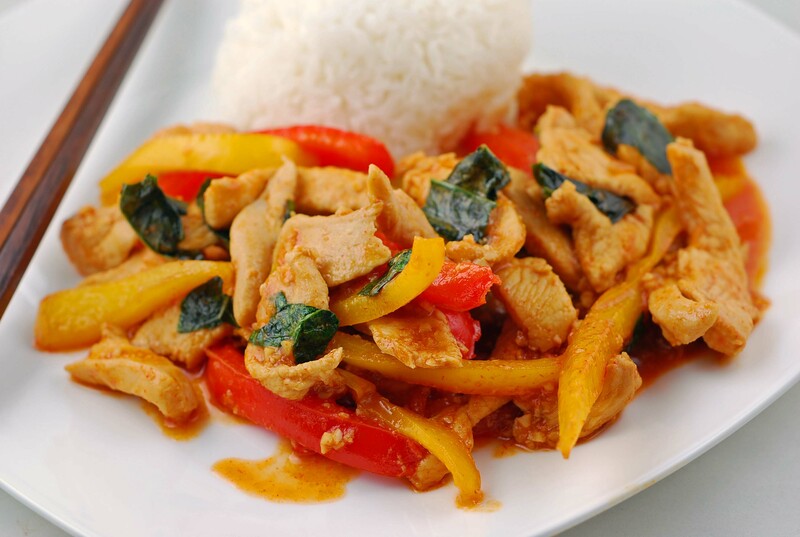 While the title may say that the chicken is soaked in chili sauce, really, there is only a little tiny pang of heat; that is nicely combined with the sweetness of the peppers. We both were in love with this dish that it showed up in our menu list again the following week. If you’re looking to change up your regular weekly menu and need an inspiration to cook chicken, give this recipe a try. Happy cooking (and eating)!. In a large bowl, make the cornstarch slurry by stirring together 2 teaspoons of soy sauce and cornstarch until the cornstarch has dissolved. Add the chicken and toss to coat well. Marinate for 10 minutes at room temperature. Set a wok or large frying pan over high heat. When a bead of water sizzles and evaporates upon contact, add the oil and swirl to coat. Add the chicken slices in one layer and cook for 2 minutes, flipping halfway. Remove the chicken from the wok, keeping as much oil in the pan as possible. The interior of the chicken will still be raw (it will get added back into the wok to finish cooking). Lower the heat to medium and add the shallots, kaffir lime leaves and garlic. Stir fry for 30 seconds. Add the red and yellow bell peppers and stir fry for 1 minute, until the peppers are softened, but still have a nice crunch in them. Pour in the fish sauce, soy sauce and sweet chili sauce and stir well. Add the chicken pieces back to the pan and let the entire thing simmer for 2 minutes. The chicken should have finished cooking (cut into a piece and check), and the sauce should be glossy and thickened. Turn off the heat and stir in the fresh basil leaves. Since I tried my hands on making my own bread; I have gotten to be really addicted to trying out new recipes. The smell of the yeast and flour being mixed together into sticky dough and then the aroma of it baking in the oven is fantastic. I promised Red a while back that I would try to make him homemade sticky buns for breakfast, so I thought that this recipe would be a great one to try on the weekends. And I was right! 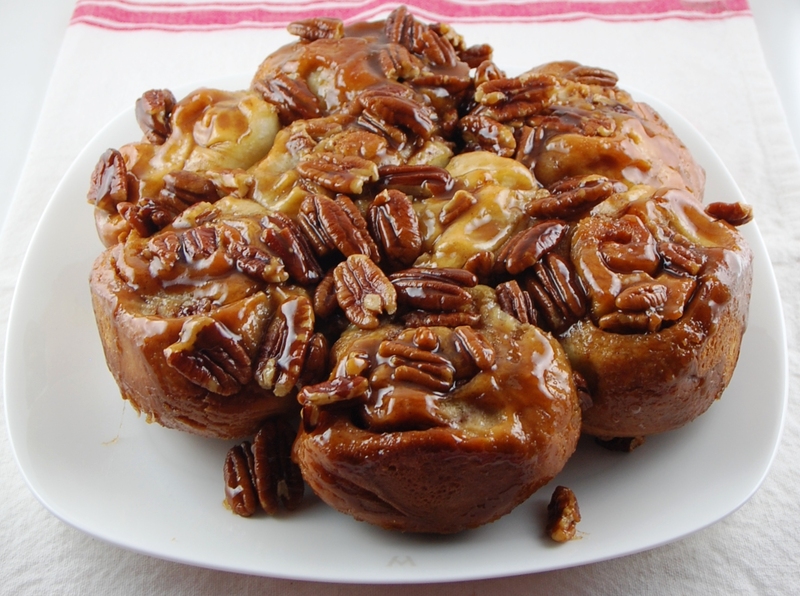 Oh my goodness… the rolls were so soft and buttery, covered in goey caramel and pecan goodness. Definitely not for the faint of heart. I actually made half of the brioche dough on a Friday night, let it sit for a couple of hours and left it in the refrigerator overnight. 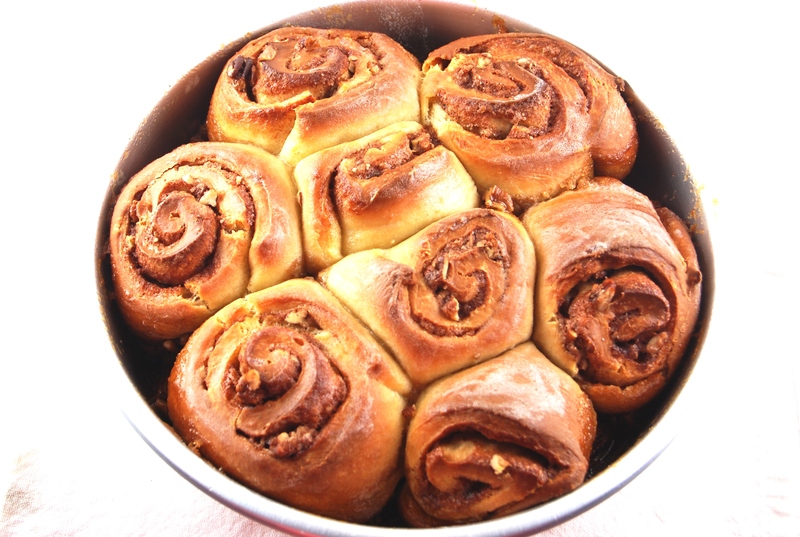 Half of the brioche dough makes doubled the recipe for the sticky pecan caramel rolls. On Saturday morning, I only had to let it rise for another hour or so, and we could enjoy it for breakfast without having to wait too long. Definitely plan for at least 3 hours and 45 minutes before you plan to serve it because it needs to sit and then bake for an hour in the oven. Eventhough it does take a little time to put together, don’t let that intimidate you. This recipe is definitely a MUST try. I can assure you that it is worth the time and the wait. This will be an impressive dish to serve as breakfast or brunch for company or family gathering. I asked Red how he liked these rolls, and his answer was, “Excellent! One of the best caramel rolls I have ever had!” I think this was a keeper for us. I hope you enjoy this as much as we did. Happy eating. Mix the yeast, salt, eggs, honey and melted butter with the water in a 5-quart bowl. Mix the flour using a heavy-duty stand mixer with a dough hook. The dough will be loose but will be firm when chilled; don’t try to work with it before chilling. Cover and allow to rest a room temperature until dough rises and collapses (or flattens on top), approx 2 hrs. Cream together the butter, salt and brown sugar. Spread ovenly over the bottom of a 9-inch cake pan using a spatula. Scatter the pecans over the butter-sugar mixture and set aside. Dust the surface of the refrigerated dough with flour and cut off a 1 to 1-1/2 lb dough piece (this is about a quarter of what the recipe for the brioche dough above makes). Dust the piece with more flour and quickly shape it into a ball by stretching the surface of the dough around the bottom on all four sides, rotating the ball a quarter-turn as you go. With a rolling pin, roll out the dough to a 1/8-inch thick rectangle. As you roll out the dough, use enough flour to prevent in from sicking to work surface but not so much as to make the dough dry. Cream together the butter, sugar and spice for the filling. Spread evenly over the rolled-out dough and sprinkle with the chopped nuts. Starting with the long side, roll the dough into a log. If the dough is too soft to cut, let it chill for 20 min to firm up. With very sharp serrated knife, cut the log into 8-equal pieces and arrange over the pecans in the pan, with the “swirled” edge facing upward. Cover loosely with plastic wrap and allow to rest and rise 1 hr (40 mins if you are using fresh, unrefrigerated dough). Twenty minutes before baking time, preheat oven to 350 deg F. If you are not using a stone in the oven, 5 min is adequate. Bake about 40 min or until golden brown and well set in the center. While still hot, run a knife around the inside of the pan to relase the caramel rolls, and invert immediately onto a serving dish. If you let them set too long, they will stick to the pan and be difficult to turn out. I can’t believe how fast this year has flown by… we’re finally here in the last month of the year. I first must apologize to some of my loyal readers that I have been MIA for about a month or so now! Yea, the cold bug got the worst of me, and with work travels… surprisingly enough, I was not in the kitchen very much this past month! Our December’s recipe for the Martha Stewart Cupcake Club (a.k.a MSC) is Gingerbread Cupcakes, selected by Kayte from Grandma’s Kitchen Table. You can find the recipe on her Cupcake book, page 246. I’m basically in the spirit of Christmas as soon as Thanksgiving weekend comes to an end and I was ready to welcome the season with this treat. I actually made these into mini cupcakes since my husband needed something to take to his company holiday party. I especially loved the fluffy vanilla frosting; nothing can beat a classic frosting like this one. Not only that it tastes good, it actually pipes pretty well. Double bonus for me! The only issue was that I forgot to adjust the baking time to accommodate the smaller muffin pans, so the cupcakes came out a bit in the dense side. Maybe a bit too dense for my taste although everyone seemed to think it’s okay. Don’t forget to check out how everyone else in our group is doing; there are some absolutely creative creations out there! 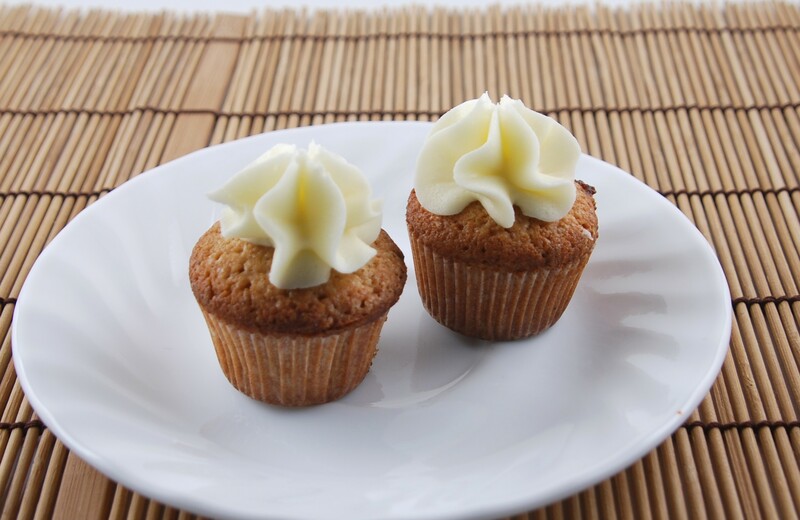 Our November’s recipe for the Martha Stewart Cupcake Club (a.k.a MSC) is Sweet Potato Cupcakes, selected by Karen from Karen’s Cookies, Cakes, & More. You can find the recipe on her Cupcake book, page 243. While some people may not really be too excited with this recipe, I was absolutely on board with the idea of using sweet potato in cupcakes. Sweet potato is soo… delicious, roasted on its own. I think it shouldn’t even be considered vegetable. And I was right… I loved them! They were absolutely fabulous: fluffy, crumbly, and has that nice hint of that sweet potato flavor that I love. The candied pecan and marshmallow topping was even better, it’s a really nice change from the regular frosting… but still look so elegant, and delicious. I love the crunchy pecan on top of the marshmallow, although I have to admit that I had a little issue with making the caramel syrup for the pecans. Thanks Karen for a great selection, I’d be making these again in the future! Don’t forget to check out how everyone else in our group is doing; there are some absolutely creative creations out there! I love eggs for breakfast and always welcome a new way to dress up eggs. I had wanted to try this recipe for a while and finally decided to try it when we have a little bit more time on the weekends. Another big reason for me wanting to try this was: I had never poached eggs before! I was a bit intimidated by the idea of poaching eggs… I don’t know why. I have enjoyed many poached eggs before at restaurants, and I had always put off making my own at home. I now regret that I didn’t try this recipe even sooner, because this dish was absolutely fabulous! If you love eggs, spinach and cheese–this one is a must try! But I must warn you, this is not exactly a “light” recipe, with all of the cheeses used. I also discovered that poaching egg was not as bad as it sounds–really, try this recipe! You will not be disappointed. Cut off any tough stalks, then wash the spinach in cold water and drain well. Place them in large pan with very little water. Cook over a medium heat, for 3-4 minutes, or until wilted and tender, then drain thoroughly and chop finely. Return the spinach to the pan, add the butter, cream and grated nutmeg and season to taste with salt and pepper, then heat gently, stirring occasionally. Spoon the spinach mixture into the base of one large or four small gratin dishes. To make the topping: heat the butter in a small pan, add the flour and cook, stirring constantly, for 1 minute to make a paste. Gradualy blend in the hot milk, beating well as it thickens to break up any lump. Cook for 1-2 minutes, stirring constantly. Remove the pan from the heat and stir in the mace and three-quarters of the Gruyere. Preheat the oven to 400 deg F. Poach the eggs one at a time. When complete, slowly place one poached egg on top of spinach. Cover with the cheese sauce and sprinkle with the remaining Grueyere and the grated Parmesan. Bake for 10 minutes or until golden. Serve immeadiately with Parmesan shavings. Kate from Warm Olives & Cool Cocktails has been playing Santa all summer long by graciously giving away her 100+ cookbooks collection! Lucky me, I won another book from her about a couple of months. The rule is pretty simple, you need to leave comments on her blog, must be a food blogger, and you also must make ONE recipe within 30 days from the book if you win, of course! Eek.. I hate to say that I am very tardy on this one, but still, better late than never. There are so many good recipes in this chocolate book, but unfortunately, I have to really dig for a recipe that has ingredients that I can get locally. And we finally settled on this one. It’s like a chocolate pie, but with yummy short-bread like crust. I had a hard time with the dough to form a ball initially, so I took the liberty on adding another egg yolk into the mixture. Maybe because I didn’t have the extra-large eggs, I figured, I might have needed a little bit more liquid in the mixture. After I rolled it out, I also had a hard time with the dough to remain in one sheet, so I picked up pieces of it, and smoothed it over with my fingers onto the pan. But after all of that, it turned out well. I also didn’t have any graham crackers at home, so instead I used about 1/4 cups of crushed vanilla wafers, and I didn’t have any issue with it. Wow… I was pleasantly surprised at how elegant this dessert turned out! It calls for simple ingredients, relatively quick to put together, and delicious! It also has a great presentation. Since they’re also like a bar, instead of a tart or pie, they are portable since they’re not too messy. I cut up into squares and Red and I had nice little treat to take to work that week! Thanks Kate!! Adapted from Chocolate Cakes, Cookies, Candies and More, published originally under the title Cioccolate & Co. 2005. Preheat the oven to 320 degree F. Place the flour and sugar into a bowl and quickly cut in the cold butter. When the mixture resembles a coarse meal, add the egg yolks, baking powder, and mix to form a compact dough. Roll out the dough into a thin sheet. Line a 10-1/2 inc round tart tin with the dough, making a slightly thicker layer around the border. Refrigerate the crust for 30 minutes. Meanwhile, melt the chocolate with the milk over a double boiler. Add the sugar and mix well to incorporate. Pour the chocolate mixture into the pastry crust and sprinkle with the crushed graham crackers and ch0pped almonds. Bake the tart for 30minutes. Remove from the oven, cool completely and cut into squares. I am always in the lookout for a simple soup recipe that is delicious, and preferably has both vegetables and meat in it. This way I can just add a salad or some sort of rolls or bread to go with it. This is actually a recipe that I have saved up for a while now. For time-saving tips, you can leave the skin on as long as you scrub them well before cutting. Red actually peeled the potatoes, although I wouldn’t have minded if he had left the skin on. I also did not have any beef or chicken bouillon. Instead, I used low-sodium canned vegetable broth and it was still wonderful. I also used low-fat milk and couldn’t tell the difference. This soup is very delicious, creamy, and flavorful–and my fave part of all, you can definitely tweak the ingredients as you wish. I am sure that you can use frozen potatoes or onions to save you time in chopping some of the vegetables. This recipe was a favorite at our house, and we will make again.